Just a couple of weeks after its grand opening, Rachel and I finally had the opportunity to try NYC import Hill Country Barbecue Market. That’s right, I said NYC. And while Hill Country features Texas barbecue, this isn’t your traditional BBQ stand. The space is completely massive, with the upstairs being completely dedicated to a huge dining room as a well as a bar in the front of the house. Meanwhile, the downstairs “club level” features more tables, a bar, and a stage for live bands. When we arrived, we were greeted by our hostess who then handed us a “meal ticket”. 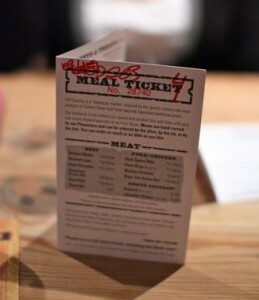 Each person who dines at Hill Country receives a ticket as it is required by the restaurant to keep track of all of its orders. Even if your party only uses one ticket for the whole table, make sure to hang onto them regardless. Otherwise, you might get penalized with a $50 fee! We arrived right in the heart of their happy hour which runs from 3pm to 7pm, seven days a week. Considering it was a Sunday evening, it was an added bonus. Hill Country featured specials on pitchers of Shiner, $5 margaritas, and two-for-one bottle specials. But as much as we want to discuss drink specials, we were here for one purpose: to eat some Texas ‘cue! The thing that sets Hill Country apart from other BBQ restaurants is that the waiter only serves you drinks, not food. You’re wholly responsible for ordering and picking up your BBQ from the “market” located on the main floor. Customers get in line and then tell the pitmaster what meats they want, ordering by the pound. Then, patrons head over to a different counter where sides and desserts are served. Being the incredibly indecisive couple that we are, we decided to go all out and order the Pitmaster’s Combo instead of individually select certain items from the meal ticket. 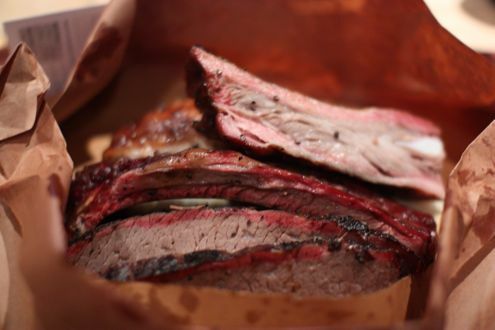 For $24, you receive a quarter pound of lean brisket, one pork spare rib, one beef rib, a quarter chicken, and two 8oz sides. It’s an additional dollar should you choose sides from their “Hot Favorites” portion of the menu. We did just that as we got both the campfire baked beans (with burnt ends!) 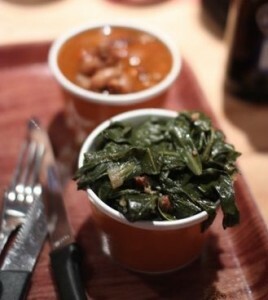 as well as the collard greens with applewood smoked bacon. Still, for $26, it’s A LOT of food. And how was it, you ask? Well, I was big fan of the brisket. Smoked for hours, it was incredibly tender and, despite receiving lean instead of moist (less fat versus more), it was delicious. It was the star of the show and some of the best brisket I’ve had in DC proper. The chicken was incredibly juicy, and while it didn’t capture the smokiness of the brisket, it was still very good. While the beef rib tasted great, I’ve had much larger ribs elsewhere. The pork spare rib was even worse as there was barely any meat at all on the bone. Let’s put it this way: I’ve found more meat on spare ribs at Chinese buffets than what Hill Country served me. I also have to admit, I was pretty disappointed with the baked beans. Considering that they were prepared with burnt ends, one of my favorite BBQ dishes (and a Kansas City specialty), these beans just weren’t very good. Too watery, barely smoky, and just not a whole lot of overall flavor. Considering I’ve had Jack Stack’s version of the dish, there is just no comparison. If you’ve had it, you know what I’m talking about. Rachel thought they were good, but then again, she hasn’t been to KC. 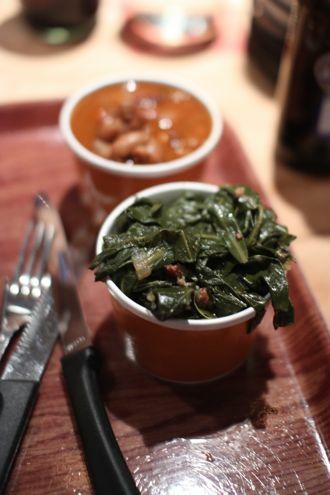 The collard greens weren’t bad, but it’s kind of difficult to mess those up. Despite all the hype, I wasn’t really blown away. Sure, the brisket and chicken were great, but the mediocre spare rib and baked beans brought things down to earth. 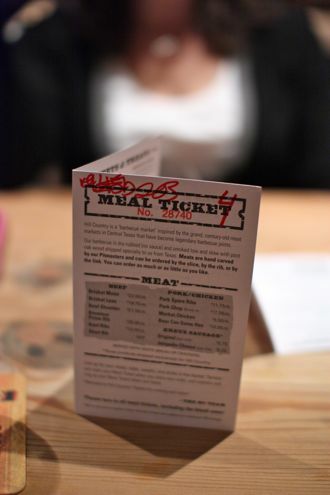 The meal ticket was also kind of a nuisance as we only ended up using one for our table but still had to hang on to the others when checking out at the register. It’s a similar gimmick Vapiano uses that I’m just not a fan of. 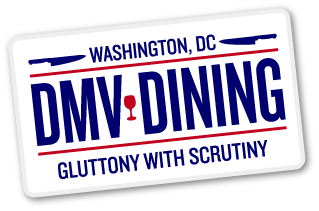 All and all, it’s nice to see another entrant in the DC barbecue market, but I think I’m just going to stick to Urban Bar-B-Que Company for now. 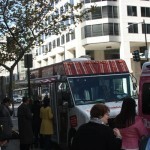 Hill Country Barbecue Market is located at 410 Seventh Street NW in the Penn Quarter neighborhood of Washington, DC.